Sergio Perez said on Saturday that he would be open to leaving Force India for another opportunity if his current team can’t find a way to move up the grid and compete for wins and championships. “That would be fantastic to move up the grid [together]” Perez said, “but if another opportunity comes in the future, it wouldn’t be that bad as well.” If a spot opened up at Mercedes or Ferrari, I think most people would agree that Perez should take it — both are competitive teams with a good history of success and have the money. But the odds of that happening appear to be pretty slim right now. Even so, Perez isn’t in a bad position by any means. Force India does appear to be climbing as of late, as does Perez himself. 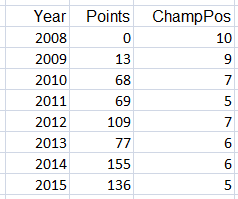 Since 2008, Force India has improved on or equaled their prior year’s position in the constructor’s championship all but once. Their first season in Formula One yielded a tenth place finish, and last year they came away with fifth, 51 points shy of Red Bull — the same Red Bull that won the constructor’s championship four years in a row starting in 2010. The team also has the luxury of running Mercedes engines, which powered the dominant performance of Mercedes AMG Petronas the last two seasons. The team had a combined 21 top-ten finishes in 2015 between Nico Hulkenberg and Perez, and finished third in Russia thanks to the latter. All of the success last season also came after a troubled start, with Force India’s B-Spec car not making its debut until Silverstone. Money problems plagued the team before the season and prevented them from even testing their car in the first two off-season tests. Otmar Szafnauer of Force India commented on the team’s late start to last season, saying “had we been able to [develop the car] at the beginning of the year, who knows where we could have finished?” The team will have a much cleaner start to 2016 and field a car they’re proud of when the green flag waves in Australia. Coupled with momentum from a strong finish to 2015, Force India looks to be in a great position to excel next season. Sergio Perez’s stock as a driver has also risen the past couple of seasons, with 2015 ending in a ninth place finish in the championship — ahead of his teammate, Hulkenberg. Perez has shown significant improvement since he found his first Formula One ride at Sauber in 2011. Perez cracked the top ten for the first time in average finish (9.2) and was just outside in average start (10.3) last season. He also scored more points than in any prior season (78) and finished all but one race — a break failure in Hungary took him out on lap 53. There’s no denying Perez’s uptick in performance, especially since he joined Force India in 2014. Perez will be joined by Hulkenberg once again at Force India in 2016. Both drivers will have multiple years driving for the team under their belt, and besides the rumors of a re-branding to Aston Martin, things appear cool, calm, and collected at Force India from the outside. Next season will be a great test for Perez and his team to keep their momentum going and challenge for the next notch up on both the constructor and driver’s championship ladders. To do the latter, Perez will have to score an estimated 100.4 points, the average number of points eighth place in the championship scored over the last five seasons. That comes out to 4.8 points per race for a 21 race season like we will see next year. A seventh place finish in every race would easily put Perez over that number — but to do that, he would need to improve his average finish by 1.2 places next year, which doesn’t seem likely without major help from the car. A few good race results like his podium in Russia would bring his necessary average finish down considerably though. How the development of next year’s car goes will play a big role in Perez’s quest to climb up another spot in the championship. Perez may be looking around for a better offer in the future, but things aren’t so bad right now. Himself and his team are both on an upward path heading into the new year. Ed Carpenter was supposed to be the ‘oval-expert’ for CFH Racing, leaving the road and street course races for Luca Filippi. Things didn’t work out as planned in 2015 for the newly formed team. Ed Carpenter competed in six races last season but failed to claim even one top-five finish. In the Indianapolis 500, the race in which he started on pole in 2013, Carpenter crashed out and finished 30th. An engine failure brought two more races to an end at Fort Worth and Pocono, though those weren’t shaping up to be much better — he qualified 15th and 21st, respectively. Fontana was perhaps his most promising race until he crashed out on lap 157 after leading one lap. The two races he did complete, Milwaukee and Iowa, yielded a tenth and sixth place finish. But in neither of those races was there really a threat to the front runners from Carpenter. He didn’t lead any laps and his teammate, Josef Newgarden, beat him in both of those races anyway. In fact, Newgarden beat him in every race last season and in half of the races in 2014. Carpenter’s younger teammate is emerging as the team’s number one driver on all types of tracks. Carpenter raced in a little over a third of the races full-time drivers did, yet only secured 88 points in the championship. Over a 16 race season, he would have earned around 250 points — good for 18th place (which is also near his average finish for 2015, 17.8). Next year’s schedule has the series returning to Phoenix International Raceway, a track where Carpenter has raced twice. His two finishes there of 19th and 16th won’t be encouraging signs for the struggling American.